It’s a color combo that elicits an immediate gut reaction: You either hate it or love it. When red and pink first crept into the fashion sphere with the S/S 18 shows—notably at Maje, Brandon Maxwell, Oscar de la Renta, and Attico—it felt polarizing and hard to pull off. Fast-forward to the next season, and the palette was a street style star. Now it appears that this eye-catching pairing is making its way into the home realm. The two colors are showcased in new collections from our favorite brands; for example, Zara Home’s holiday campaign prominently featured red and pink in moodier, deeper tones. The palette manifested IRL at one of NYC’s hottest new shops: the Glossier flagship, which is cloaked in soft pink and vibrant red for contrast. 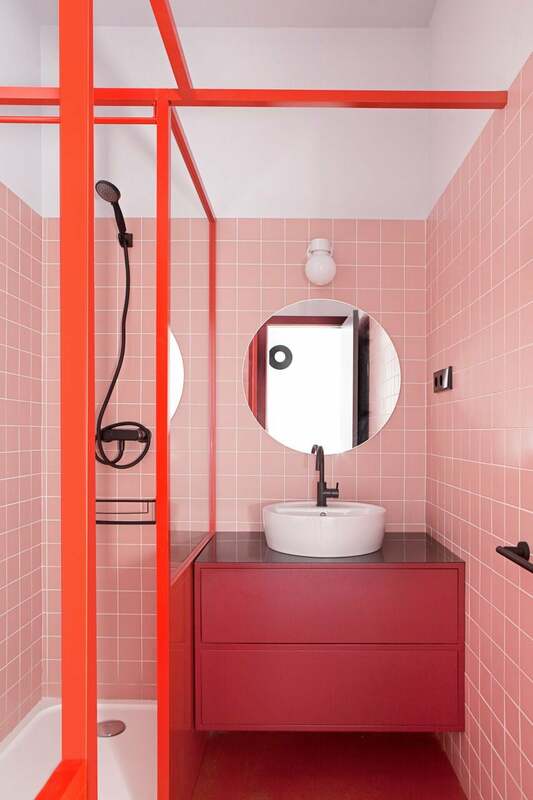 To help you embrace one of the year’s trendiest color palettes, we’ve pulled together a few interior spaces that prove red and pink can be doable in the home. Plus, keep scrolling to shop the trend with the coolest red and pink pieces on the market right now—because not everyone can test out funky color combinations with paint. When painting your walls feels too cliché, turn your attention downward. Giving wood floors a fresh coat of color is an unexpected twist that packs a punch; take a page from this space and mix pink and red together. The geometric pattern adds another level of visual interest. For a more minimalist look, keep your living room pared back and neutral and then bring in color via your seating options. Pairing together pink and red sofas (or a pink sofa and a red ottoman or a red sectional and a pink armchair… you get the picture) is a fun way to try your hand at the tonal trend. Granted, this contemporary space belongs to a restaurant, not a home, but the lesson of pairing a bubblegum pink sofa against a tomato red wall is sticking with us. While indisputably modern and of the moment, this color combination can still feel timelessly elegant. The key is opting to decorate with the shades in subtler tones (for example, a deep crimson red sofa in lieu of a bright cherry red one) and bringing in old-school charm with accents. Gilded frames on the gallery wall break up the shocking pink, while a tufted sofa is uber luxurious. When set on an otherwise empty surface, this ombre tray set will be the only accent piece your coffee table needs. Featuring bright pink with twinges of fuchsia (that, from a distance, almost look red), Urban’s rug will instantly jazz up empty floors. The faded, antique look keeps this combo from being too overwhelming. If you really want to embrace the pink-and-red look, drape a dark red throw over the end of this pink striped bedding. No space to test out this combo in an assortment of seating options in your living room? Keep it confined to one piece. Coming Soon’s two-tone chair is a retro treat to behold. Eons more interesting than a standard vase, this mesh option (which is totally water-resistant) will look great paired with any red flower. Use it as an easy centerpiece for your next casual dinner party.